Went to the De Young over the weekend with some of my girlfriends to check out the Vivienne Westwood exhibit. I have to say I will probably wear be able to pull off only about a quarter of the stuff that she makes. I do however, appreciate the level of detail she puts into her clothes, expecially her evening wear. They were showing a video interview about her work in general. She goes as far as saying that she hopes that the people who criticize her work are only doing so as a reaction to the banality of every other clothes that are out there in the world. After the exhibit, we went over to the museum store. I love museum stores. Its a great place to see hard-to-find items. 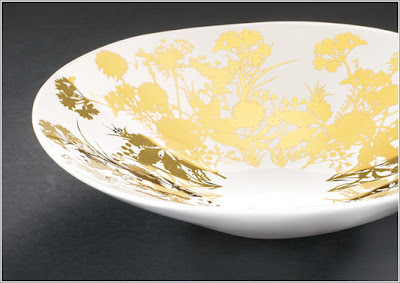 One that caught my attention at the De Young store is this Brella Bowl from Umbra dsigned by Michelle Ivankovic.